Malicious and intentional acts of animal cruelty against a dog, cat or horse should be a class 6 felony in South Dakota punishable by two years in prison or a $4,000 fine, or both. Passing felony animal cruelty laws for companion animals is a crucial step in deterring violent offenders, ensuring community safety, and protecting pets. 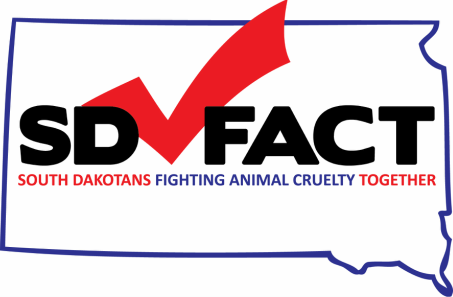 In South Dakota state law, the same level of penalty applies whether someone neglects to provide adequate food for an animal or maliciously stabs, tortures and kills that animal. Neighboring states have had these laws on the books for 10 to 20 years and these states still enjoying a viable Ag economy. The proposed language will exempt traditional Ag practices as well as hunting and fishing. 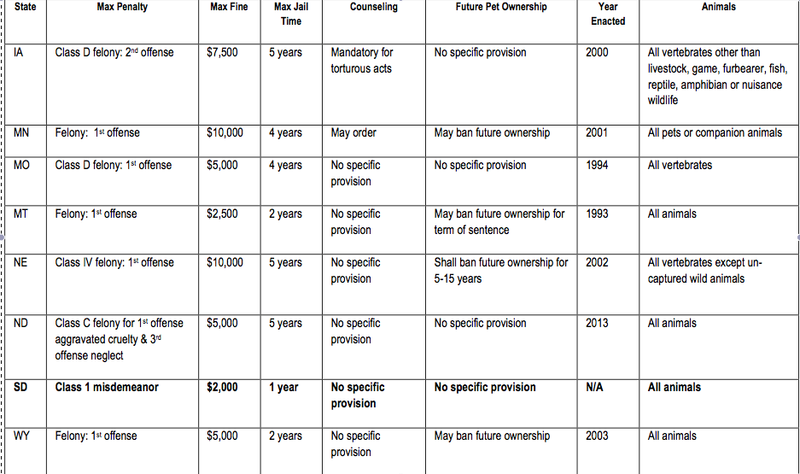 The table below compares SD’s current laws for torturing a pet to those in neighboring states (data gathered from ALDF, Pet Abuse.com, The HSUS, ASPCA, and official state statute websites). There is a proven link between animal cruelty and human violence, acts of malicious and intentional cruelty against an animal should be taken seriously, the state should appropriate prison time, fines should be mandated and counseling offered for these violent offenders. Acts of intentional cruelty are often some of the most disturbing and violent offences and should be considered signs of serious psychological problems. People who abuse and kill animals are more likely to target human victims. Many times a parent or domestic partner who is abusive may kill, or threaten to kill, the household pets to intimidate family members into sexual abuse, to remain silent about previous or current abuse, or simply to psychologically torture the victims, flexing their "power". Horrific acts of animal cruelty don't happen often but when they do, appropriate state laws should be in place to ensure prosecutors have the tools in place to deal with violent offenders and the perpetrators get a mental health evaluation & counseling (if appropriate) so they will not go on to harm humans.